It is essential for a neurosurgeon to know individual anatomy and the corresponding anatomical landmarks before starting a surgery. Continuous training, especially of young neurosurgeons, is crucial for understanding complex neuroanatomy. In this study, we used a neuronavigation system with 3D volumetric image rendering to determine the anatomical relationship between the sagittal suture and the superior sagittal sinus (SSS) in patients with intracranial lesions. Furthermore, we discussed the applicability of such system in preoperative planning, residency training, and research. 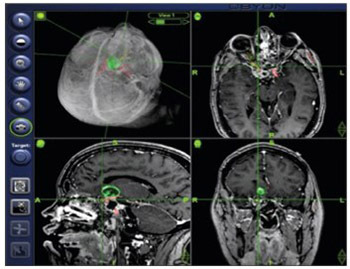 The study included 30 adult patients (18 female/12 male) who underwent a cranial computed tomography (CT) scan combined with venous angiography, for preoperative planning. The position of the sagittal suture in relation to the SSS was assessed in 3D CT images using an image guidance system (IGS) with 3D volumetric image rendering. Measurements were performed along the course of the sagittal sinus at the bregma, lambda, and in the middle between these two points. The SSS deviated to the right side of the sagittal suture in 50% of cases at the bregma, and in 46.7% at the midpoint and lambda. The SSS was displaced to the left of the sagittal suture in 10% of cases at the bregma and lambda and in 13% at the midpoint. IGSs with 3D volumetric image rendering enable simultaneous visualization of bony surfaces, soft tissue and vascular structures and interactive modulation of tissue transparency. They can be used in preoperative planning and intraoperative guidance to validate external landmarks and to determine anatomical relationships. In addition, 3D IGSs can be utilized for training of surgical residents and for research in anatomy.